It remains to be seen whether T-Mobile’s new Un-carrier strategy and the increasingly outrageous antics of T-Mobile CEO John Legere are changing any minds about how consumers should buy phones and their mobile service, but they’re definitely changing consumers’ perceptions about T-Mobile. 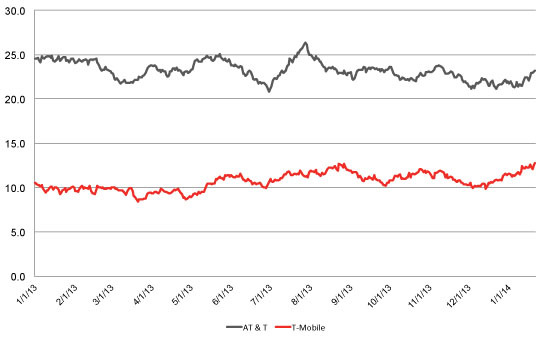 Brand researcher YouGov released new data from its BrandIndex survey this week that show that consumers estimations of T-Mobile are on the rise – and they’re rising at the expense of arch-enemy AT&T(s t). The BrandIndex’s key metric, called purchase consideration, found that the percentage of consumers willing to consider purchasing AT&T service has fallen from 25 percent to 23 percent since the beginning of 2013, while the percentage considering T-Mobile service has risen from 10 percent to 13 percent. YouGov polled 30,000 adult consumers for the report. The YouGov poll on perceived value of mobile service found that both carriers started out 2013 roughly even, with a slightly negative perception. 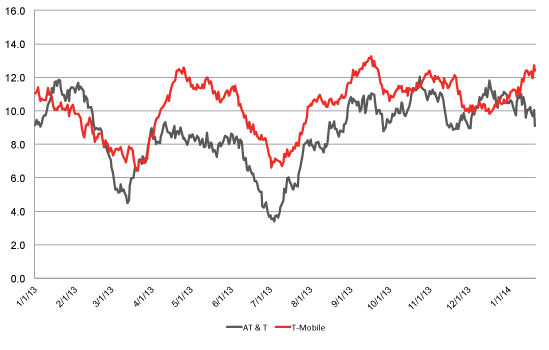 But ever since T-Mobile started selling the iPhone(s aapl) last spring, its scores have been rising, while AT&T’s have been falling. 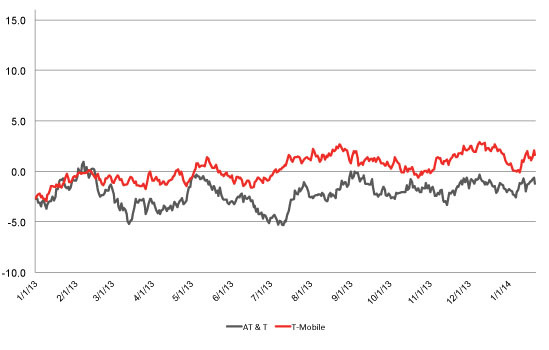 In terms of customer satisfaction, AT&T is still well ahead of T-Mobile, but as in the case of purchase consideration, T-Mobile is gaining. Its satisfaction score has risen from 3 to 5 (measured from -100 to 100) in the last year, while AT&T’s has stayed flat at 7. Finally YouGov measured the more abstract concept of buzz, asking consumers at various points of the year if they had heard anything negative or positive about the two carriers in recent weeks. T-Mobile saw a lot of spikes coinciding with its big Un-carrier announcements: the launch of its first iPhone in April, the rollout of its Jump phone upgrade program in late summer, and its offer at CES to pay switchers’ early termination fees. Legere made be loud and brash, but he’s definitely being heard. We’ll see whether T-Mobile’s recent goodwill is being translated into more customers in next month when T-Mobile reports its Q4 earnings. 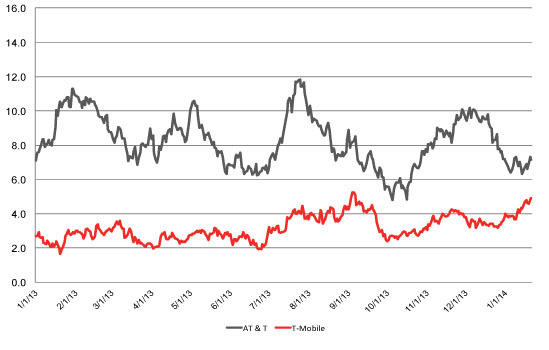 Verizon Wireless(s vz)(s vod) so far appears unfazed, adding 1.7 million new connections in the last three months of 2013. AT&T, not Verizon, has been the biggest target for T-Mobile’s attacks, and of all the operators it has reacted most directly to its un-carrier strategy.